As an office manager, one of your biggest responsibilities is ensuring that everything is running smoothly, and the workplace environment is productive. One of the biggest factors to consider when creating a productive workspace environment is the overall comfort of the employees. When several people are working in one workspace, things tend to get cluttered, and distractions are plenty. 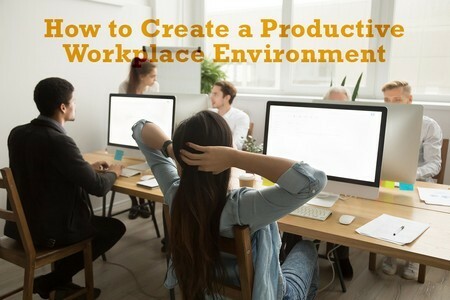 To avoid these production killers, you will want to find ways to improve the overall functional space of the workplace and encourage productivity and efficiency. If your job requires you to sit at a desk, then it is important that your office space is utilizing proper chairs and desks to ensure everyone’s comfort. For example, when sitting in a chair for an extended amount of time, you will want to have armrests so that your shoulders can remain relaxed. Also, make sure that the desk is the proper height and adjust the chair accordingly. If you have poor lighting, this can seriously impact the overall productivity levels and efficiency of your workplace environment. Windows that provide ample natural light are great for boosting one’s mood. Proper lighting at each desk is also important to help with reading and other tasks that must be regularly performed. Cleanliness, order, and organization are also keys that may lead to success in the office. A cluttered desk can make it hard to work or difficult to find what you need when you need it. Clear your desk of all the unnecessary items and organize what you use on a daily basis and keep it close and within your reach. Make sure the trash receptacles are empty and not overflowing, and the floor and other common areas are clean, sanitary, and clutter free to improve everyone’s mood and promote productivity. Following all these tips in the workplace are the first positive steps towards a happier and more productive environment that is conducive to success and high morale.